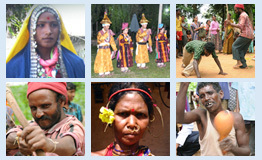 The chinali community: people, ethnicity, geoeraphy. Within a total population 31,564 (Govt. of India, 2011) of Lahul & Spiti district of Himachal Pradesh reside a small number of 215 people along the banks of river Chinab or the Chandrabhaga whose mother tongue is Chinali and are popularly known as the Chinals of this Himalayan area. Presently most of these are highly educated people; many of them occupy administrative posts in the offices at the Government of India and the Government of Himachal Pradesh. Some of them follow Buddhism (Mongoloid Budhists) and many have faith in Hinduism (Swanglas). They enjoy rice as their staple food besides wheat and maize. There are two theories regarding the origin and settlement of Chinali community in Himachal Pradesh. The first theory claims that their ancestors have migrated from Gool Gulabgarh, Doda and Kashtwar of Chinab Valley in Jammu and Kashmir. These are the descendants of Aryans. The second theory claims that their ancestors migrated from Rajasthan and thus belong to the Rajput caste. The state unrest and turmoil during the earlier times have been attributed to be the reason for migration; this reason, interestingly, remains common to the adherers of both the theories. Across Himachal Pradesh mostly all Chinals are associated with agriculture as their primary occupation. With an obvious SOV word order, Chinali is classified as a language belonging to Indo-Aryan language family, written in Devanagri script, having a good collection of literature mainly comprising poetry and folklore, without any prominent dialectal variation(s). It is a mother tongue of not more than 1000 people domiciled in the state of Himachal Pradesh. Chinali can be classified as a class dialect which is totally confined to intra-community communications of a particular community that is also known as Chahns, Dagis or Domba besides Chinals. Sharma, D. D. (1991).A Descriptive Grammar and Vocabulary of Chinali. Shimla: Himachal Academy of Arts, Culture and Languages. To document Chinali language, the following works are in progress. 3. Making of a digital tri-lingual pictorial dictionary.